Plain Graces: Christmas In July! Here is my "wordless" Wednesday attempt. July in Nebraska can be miserable. To liven things up and brighten the dog days of summer, I like to celebrate Christmas in July. It's also another opportunity to remind the children of God's love and the real "reason for the season". I use my small tree that has been used in my dorm rooms, classrooms, Sunday School rooms, plays, and any other activities that I dream up. 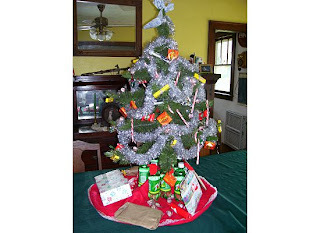 (It wears a very versatile tree skirt.) To celebrate Christmas in July, I donned my flip flops and cruised the Dollar Store aisles for some great deals. In lieu of ornaments, I decorated our tree using candy and other goodies. The kids were amazed and loved the whole idea of a tree completely covered in sugar. We read the Nativity, watched Rudolph and Frosty, feasted on a ham dinner, and nibbled on frosted Christmas sugar cookies. We also exchanged small presents that cost $1 or less. It was a nice break from the bug spray and sunblock. My family and the daycare children thought I went a little crazy, but it's fun to do something completely out of the norm on occasion. I also saved candy canes from the tree in December! I didn't let the kids eat them, but they were a great addition. Remember to check out the contests and giveaways! Tonight is the last night to register for the Nebraska Product Giveaway! What would be wrong with the candy canes?